Disclosed herein is a cosmetic composition, in particular a hair composition, comprising, in a cosmetically acceptable medium, at least one quaternary ammonium cationic surfactant, at least one aminated silicone, at least one fatty alcohol, and at least one diol comprising 6 carbon atoms. This application claims benefit of U.S. Provisional Application No. 60/612,873, filed Sep. 27, 2004, the contents of which are incorporated herein by reference. This application also claims benefit of priority under 35 U.S.C. § 119 to French Patent Application No. 04/51990, filed Sep. 8, 2004, the contents of which are also incorporated by reference. Disclosed herein are novel cosmetic compositions, for example, hair compositions, comprising at least one cationic surfactant, at least one aminated silicone, at least one fatty alcohol, and at least one diol. Also disclosed is the use of these compositions in cosmetics, for example, in conditioners. Conventional conditioners comprising a cationic surfactant and fatty alcohols may make it possible to obtain good cosmetic properties for the hair. However, the user may sometimes have the feeling that the hair is heavy and lank, and that it easily returns to a greasy condition, particularly if the hair is fine. Furthermore, for some hair types, the cosmetic properties of the conventional conditioner may be inadequate. In addition, the distribution of the product is sometimes difficult. The present inventors have discovered that compositions comprising at least one cationic surfactant, at least one quaternized or non-quaternized aminated silicone, at least one fatty alcohol, and at least one diol comprising 6 carbon atoms, in certain ratios between the various constituents, may overcome the abovementioned disadvantages. These compositions may also make it possible to render the fiber more supple, i.e., render the fiber less rough and more malleable. The inventors have also found that, during application to fibers such as hair, the compositions may be easily distributed and easily spread from the roots to the ends, and/or may be easier to rinse out. Finally, these compositions may confer good cosmetic properties on keratin fibers, such as the hair, for example, the hair may have improved disentangling and/or smoothness, the hair may be light and return more slowly to a greasy condition, and/or the hair may be very easily and/or lastingly shaped. One embodiment of the present disclosure is thus a non-coloring cosmetic composition, for example, a hair composition, comprising, in a cosmetically acceptable medium, at least one cationic surfactant chosen from quaternary ammonium salts, at least one quaternized or non-quaternized aminated silicone, at least one fatty alcohol, and at least one diol comprising 6 carbon atoms, wherein the ratio of the weight concentrations of fatty alcohol/cationic surfactant is greater than or equal to 1, the ratio of the weight concentrations of cationic surfactant/silicone is greater than or equal to 0.85 and the ratio of the weight concentrations of fatty alcohol/silicone ranges from 2 to 15. Another embodiment of the disclosure is a cosmetic haircare process comprising applying the compositions of the disclosure to the hair. A further embodiment of the instant disclosure is a process for the cosmetic treatment of the hair and/or scalp comprising applying the compositions applying the compositions of the present disclosure to the hair and/or scalp. Still a further embodiment of the present disclosure is a process for conditioning keratinous substances, such as the hair, comprising applying the compositions disclosed herein to the keratinous substances. Other characteristics, aspects, subject-matters and advantages of the present disclosure will become even more clearly apparent on reading the description and examples which follow. As used herein, the term “cosmetically acceptable medium” is understood to mean a medium compatible with keratinous substances, such as the skin, hair, nails, eyelashes, eyebrows, lips, and/or any other region of the body and/or face. As used herein, the term “non-coloring composition” is understood to mean a composition comprising essentially no oxidation dye, for example, less than 0.5% by weight, or less than 0.1% by weight with respect to the total weight of the composition, or comprising no oxidation dye. The cosmetically acceptable medium may comprise at least one medium chosen from water, from cosmetically acceptable solvents, for example, hydrophilic solvents, and from water-solvent mixtures. These solvents may be alcohols, for example, linear or branched C1-C6 monoalcohols, such as ethanol, tert-butanol, n-butanol, isopropanol, and n-propanol. The cosmetically acceptable medium may be present in the composition in an amount ranging from 30% to 99% by weight, with respect to the total weight of composition, for example, from 60% to 90% by weight. Examples of quaternary ammonium salts suitable for use as cationic surfactants in the compositions disclosed herein include alkylpyridinium salts, imidazoline ammonium salts, di(quaternary ammonium) salts, and ammonium salts comprising at least one ester functional group. X− is an anion chosen from halides, acetates, phosphates, nitrates, ethyl sulphates, and methyl sulphates. A non-limiting example of such di(quaternary ammonium) salts is propanetallowdiammonium dichloride. X− is an organic or inorganic, simple or complex anion; with the proviso that the sum x+y+z ranges from 1 to 15, that when x=0, then R16 denotes R20, and that when z=0, then R18 denotes R22. The R15 alkyl radicals may be linear or branched. In one embodiment, the R15 alkyl radicals are linear. For example, R15 may be chosen from methyl, ethyl, hydroxyethyl, and dihydroxypropyl radicals. In another aspect, R15 may be chosen from methyl and ethyl radicals. According to one embodiment of the instant disclosure, the sum x+y+z may range from 1 to 10. In another embodiment, when R16 is an R20 hydrocarbon radical, it may comprise, for example, from 12 to 22 carbon atoms, or from 1 to 3 carbon atoms. In at least one embodiment, when R18 is an R22 hydrocarbon radical, it may comprise from 1 to 3 carbon atoms. According to another embodiment of the present disclosure, R17, R19, and R21, which may be identical or different, may be chosen from saturated or unsaturated, linear or branched C1-C21 hydrocarbon radicals, for example, saturated or unsaturated, linear or branched C11-C21 alkyl and alkenyl radicals. In a further embodiment of the disclosure, x and z, which may be identical or different, are equal to 0 or 1. In another embodiment, y is equal to 1. In yet another embodiment, r, n, and p, which may be identical or different, are equal to 2 or 3. In still a further embodiment, r, n, and p are equal to 2. The anion X− may be chosen from halides, for example, chloride, bromide, and iodide, and (C1-C4)alkyl sulphates, such as methyl sulphate. Other suitable anions include, but are not limited to, methanesulphonate, phosphate, nitrate, tosylate, anions derived from organic acids, such as acetate or lactate, and any other anions compatible with the ammonium comprising an ester functional group. In one embodiment, the anion X− is chosen from chloride and methyl sulphate. R17, R19, and R21, which may be identical or different, are chosen from saturated or unsaturated, linear or branched C13-C17 hydrocarbon radicals, for example, saturated or unsaturated, linear or branched C13-C17 alkyl and alkenyl radicals. In one embodiment, the C13-C17 hydrocarbon radicals are linear. Examples of compounds of formula (IV) include salts (for example chlorides and methyl sulphates) of diacyloxyethyldimethylammonium diacyloxyethyl(hydroxyethyl) methylammonium, monoacyloxyethyldi(hydroxyethyl)methylammonium, triacyloxyethylmethylammonium, monoacyloxyethyl(hydroxyethyl)dimethylammonium, and mixtures thereof. In one embodiment, the acyl radicals may comprise from 14 to 18 carbon atoms and may be derived from plant oils, such as palm and sunflower oils. When the compound comprises several acyl radicals, these radicals be identical or different. These products may be obtained, for example, by direct esterification of triethanolamine, triisopropanolamine, alkyldiethanolamine or alkyldiisopropanolamine, optionally oxyalkylenated, with fatty acids or with mixtures of fatty acids of vegetable or animal origin, or by transesterification of their methyl esters. This esterification may be followed by quaternization using at least one alkylating agent chosen from alkyl halides (for example, methyl halides and ethyl halides), dialkyl sulphates (for example, dimethyl sulphate and diethyl sulphate), methyl methanesulphonate, methyl para-toluenesulphonate, ethylene chlorohydrin, and chlorohydrin. Such compounds are, for example, sold under the names Dehyquart® by Cognis, Stepanquat® by Stepan, Noxamium® by Ceca, and Rewoquat® WE 18 by Rewo-Goldschmidt. The composition according to the disclosure may comprise a mixture of quaternary ammonium mono-, di-, and triester salts, with a majority by weight of diester salts. Examples of mixtures of ammonium salts that may be used include, but are not limited to, mixtures comprising 15 to 30% by weight of acyloxyethyldi(hydroxyethyl)-methylammonium methyl sulphate, 45 to 60% of diacyloxyethyl(hydroxyethyl)methyl-ammonium methyl sulphate, and 15 to 30% of triacyloxyethylmethylammonium methyl sulphate, wherein the acyl radicals may comprise from 14 to 18 carbon atoms and may be derived from palm oil which is optionally partially hydrogenated. It is also possible to use quaternary ammonium salts comprising at least one ester functional group, such as those disclosed in U.S. Pat. Nos. 4,874,554 and 4,137,180. In at least one embodiment of the present disclosure, the quaternary ammonium salts corresponding to formula (I) are used in the compositions disclosed herein. Mention may be made of dipalmitoylethylhydroxyethylmethylammonium salts (for example, methyl sulphates) and tetraalkylammonium salts (for example, chlorides), such as, dialkyldimethylammonium and alkyltrimethylammonium salts in which the alkyl radical comprises from 12 to 22 carbon atoms, for example, behenyltrimethylammonium, distearyldimethylammonium, cetyltrimethylammonium, and benzyldimethylstearyl-ammonium salts (for example, chlorides). In addition, mention may be made of, palmitylamidopropyltrimethylammonium salts (for example, chlorides) and stearamidopropyldimethyl(myristyl acetate)ammonium salts (for example, chloride), such as the stearamidopropyldimethyl(myristyl acetate)ammonium chloride sold under the name Ceraphyl® 70 by Van Dyk. In at least one embodiment, the cationic surfactants used in the presently disclosed compositions are quaternary ammonium salts chosen from behenyltrimethylammonium chloride, dipalmitoylethyl(hydroxyethyl)methylammonium methyl sulphate, cetyltrimethylammonium chloride, quaternium-83, behenylamido-propyl(2,3-dihydroxypropyl)dimethylammonium chloride, and palmitylamidopropyl-trimethylammonium chloride. The at least one cationic surfactant may be present in the composition in an amount ranging from 0.01 to 10%, for example, from 0.1 to 5%, or from 0.2 to 4%, by weight relative to the total weight of the composition. in which R″ is chosen from hydrogen, phenyl radicals, benzyl radicals, and saturated monovalent hydrocarbon radicals, for example, alkyl radicals comprising from 1 to 20 carbon atoms; Q is chosen from linear or branched groups of formula CrH2r, wherein r is an integer ranging from 2 to 6, for example, from 2 to 4, and A− is chosen from halide ions, such as fluoride, chloride, bromide, and iodide. in which m is a number ranging from 1 to 2000, for example, from 1 to 10, and n is a number ranging from 0 to 1999, for example, from 49 to 149, wherein the sum (n+m) may range from 1 to 2000, for example, from 50 to 150. Such polymers are described, for example, in European Patent Application No. 0 095 238 A.
s is a number representing a mean statistical value ranging from 20 to 200, for example, from 20 to 50. Such aminated silicones are disclosed, for example, in U.S. Pat. No. 4,185,087.
r is a number representing a mean statistical value ranging from 2 to 200, for example, from 5 to 100. 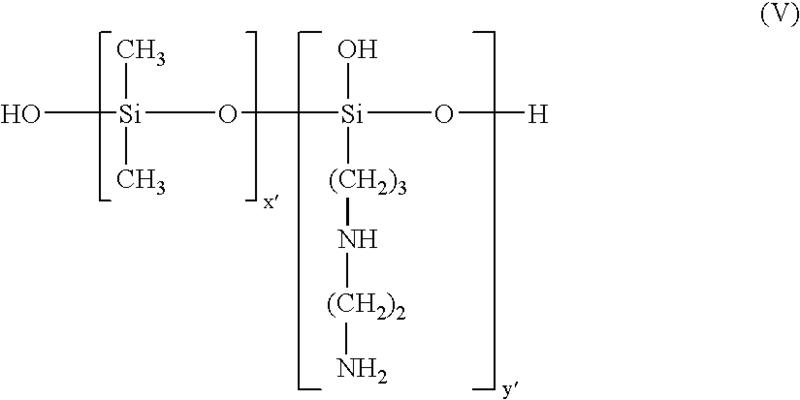 These silicones are described, for example, in European Patent Application No. 0 530 974 A.
x is a number chosen such that the amine number ranges from 0.01 to 1 meq/g. In at least one embodiment of the present disclosure, the silicones used in the compositions disclosed herein include, but are not limited to, polysiloxanes comprising amino groups, such as amodimethicones and trimethylsilylamodimethicones (CTFA, 4th edition, 1997), and silicones comprising quaternary ammonium groups. The at least one aminated silicone may be present in the composition in an amount ranging from 0.01 to 6%, for example, from 0.1 to 3%, or from 0.4 to 2% by weight relative to the total weight of the composition. The at least one fatty alcohol according to the present disclosure may be linear or branched and saturated or unsaturated, and may comprise from 8 to 40 carbon atoms. In at least one embodiment, the fatty alcohols may be oxyalkylenated or glycerolated. The fatty alcohol may have the structure R—OH, in which R is chosen from saturated or unsaturated, linear or branched radicals comprising from 8 to 40 carbon atoms, for example, from 8 to 30 carbon atoms. In one embodiment, R may be chosen from C12-C24 alkyl groups and C12-C24 alkenyl groups. R may also be substituted with at least one hydroxyl group. In another embodiment, R is not substituted with a hydroxyl group. Examples of suitable fatty alcohols include, but are not limited to, cetyl alcohol, stearyl alcohol, behenyl alcohol, oleyl alcohol, and mixtures thereof. m is the number of ethylene oxide groups and/or propylene oxide groups, and may range from 1 to 250, for example, from 2 to 100.
n is the number of glycerol groups, and may range from 1 to 30, for example, from 1 to 10. In at least one embodiment of the present disclosure, the oxyalkylenated fatty alcohols used in accordance with the disclosure may be chosen from saturated or unsaturated, linear or branched fatty alcohols comprising from 10 to 20 carbon atoms and from 2 to 40 ethylene oxide groups. WITCONOL APM (Goldschmidt) [myristyl alcohol 3 PO]. Examples of glycerolated fatty alcohols include, but are not limited to, lauryl alcohol comprising 4 mol of glycerol (INPCI name: polyglyceryl-4 lauryl ether), oleyl alcohol comprising 4 mol of glycerol (INPCI name: polyglyceryl-4 oleyl ether), oleyl alcohol comprising 2 mol of glycerol (INCI name: polyglyceryl-2 oleyl ether), cetearyl alcohol comprising 2 mol of glycerol, cetearyl alcohol comprising 6 mol of glycerol, oleyl/cetyl alcohol comprising 6 mol of glycerol, and octadecanol comprising 6 mol of glycerol. The at least one fatty alcohol may also be a mixture of fatty alcohols, which means that, in a commercial product, several types of fatty alcohols can coexist in the form of a mixture. In at least one embodiment, the fatty alcohol may be solid or pasty at a temperature of 20° C. As used herein, the term “fatty alcohol which is solid or pasty at 20° C.” is understood to mean a fatty alcohol exhibiting a viscosity, measured with a rheometer with a rate of shear of 1 s−1, of greater than or equal to 1 Pa·s. The at least one fatty alcohol of the present disclosure may be non-oxyalkylenated and/or non-glycerolated. The at least one fatty alcohol may be present in the composition in an amount ranging from 0.1 to 15%, for example, from 0.5 to 10%, or from 2 to 8% by weight relative to the total weight of the composition. As used herein, the term “diol comprising 6 carbon atoms” is understood to mean any hydrocarbon compound comprising 2 hydroxyl functional groups and 6 carbon atoms. The at least one diol may be linear or branched and may comprise ether functional groups. The diol may be chosen from, for example, 1,6-hexanediol, dipropylene glycol, and mixtures thereof. The at least one diol may be present in the composition in an amount ranging from 0.1 to 10%, for example, from 0.25 to 5%, or from 0.5 to 3% by weight relative to the total weight of the composition. The ratio of the weight concentrations of fatty alcohol/cationic surfactant may range from 1 to 10, for example, from 1 to 5. The ratio of the weight concentrations of cationic surfactant/silicone may range from 0.85 to 10, for example, from 0.85 to 5. The ratio of the weight concentrations of fatty alcohol/silicone may range from 2 to 10, for example, from 2 to 5. The composition according to the present disclosure may also comprise at least one additive chosen from fragrances, UV screening agents, nonionic surfactants, anionic surfactants, amphoteric surfactants, zwitterionic surfactants, preservatives, proteins, vitamins, provitamins, nonionic polymers, anionic polymers, cationic polymers, amphoteric polymers, and zwitterionic polymers, mineral oils, vegetable oils, and synthetic oils, non-aminated silicones, vegetable waxes, ceramides, and any other additives conventionally used in cosmetic compositions, such as antidandruff agents, agents for combating hair loss, dyes, pigments, reducing agents, and polyols, other than those disclosed above. These additives may be present in the composition in an amount ranging from 0.001 and 20% by weight relative to the total weight of the composition. The exact amount of each additive will depend on its nature and the selected hair application, and may be readily determined by a person skilled in the art. A person skilled in the art will take care to choose the optional additives and their amounts so that they do not harm the properties of the compositions of the present disclosure. The compositions according to the present disclosure may be provided in a form chosen from fluids, thickened liquids, gels, creams, simple emulsions, and multiple emulsions. The compositions for the cosmetic treatment of keratinous substances in accordance with the present disclosure may also be provided in the form of a foam or mousse and may be used in rinse-out or leave-in applications. In this case, they can be packaged in an aerosol device. The compositions of the present disclosure may be used, for example, in shampoos, conditioners, bleaching products, perming products, styling products, rinse-out care products, deep care masks, shower gels, and scalp-treatment lotions and creams, or alternatively may be deposited on wipes. The present disclosure further relates to a method for the cosmetic treatment of the hair and/or scalp comprising applying the compositions according to the disclosure to the hair and/or scalp. Also disclosed herein is a method for conditioning keratinous substances, such as the hair, comprising applying the compositions disclosed herein to the keratinous substances, for example, as a conditioner. Further disclosed herein is a cosmetic treatment method comprising applying the cosmetic composition according to the disclosure to wet or dry hair, optionally followed by rinsing. In one embodiment, the composition may be applied after shampooing. In another embodiment of the disclosure, the compositions according to the disclosure are used as conditioners for the treatment of the hair and/or scalp. In this case, the compositions may be applied to wet or dry hair, in amounts effective in treating the hair, this application optionally being followed by rinsing. By way of non-limiting illustration, concrete examples of certain embodiments of the present disclosure are given below. The amounts are expressed as active material, unless otherwise indicated. Compositions A and B were applied to the hair, followed by rinsing. Composition A was distributed more easily over the hairs from the root to the tip. Furthermore, composition A was easier to rinse out than composition B. The hair treated with composition A was also more supple under water. It was observed that the hair treated with composition A was easier to disentangle and smoother than the hair treated with composition B.
Compositions A and B were applied to the hair, followed by rinsing. Composition A was easier to rinse out than composition B.
Compositions A and B were applied to the hair, followed by rinsing. Composition A was easier to rinse out than composition B. The hair treated with composition A was more supple under water. the ratio of the weight concentrations of fatty alcohol/silicone ranges from 2 to 15.
with the proviso that the sum x+y+z ranges from 1 to 15, that when x has a value of 0, then R16 denotes R20, and that when z has a value of 0, then R18 denotes R22. 3. The composition of claim 2, wherein the compound of formula (IV) is chosen from diacyloxyethyldimethylammonium salts, diacyloxyethyl(hydroxyethyl)methylammonium salts, monoacyloxyethyldi(hydroxyethyl)methylammonium salts, triacyloxyethyl-methylammonium salts, monoacyloxyethyl(hydroxyethyl)dimethylammonium salts, and mixtures thereof. 4. The composition of claim 2, wherein the surfactant of formula (I) is chosen from dipalmitoylethylhydroxyethylmethylammonium salts, behenyltrimethylammonium, distearyldimethylammonium salts, cetyltrimethylammonium salts, benzyldimethylstearyl-ammonium salts, palmitylamidopropyltrimethylammonium salts, and stearamidopropyl-dimethyl(myristyl acetate)ammonium salts. 5. The composition of claim 1, wherein the at least one cationic surfactant is chosen from behenyltrimethylammonium chloride, cetyltrimethylammonium chloride, quaternium-83, behenylamidopropyl(2,3-dihydroxypropyl)dimethylammonium chloride, and palmitylamidopropyltrimethylammonium chloride. 6. The composition of claim 1, wherein the at least one cationic surfactant is present in the composition in an amount ranging from 0.01 to 10% by weight relative to the total weight of the composition. 7. The composition of claim 6, wherein the at least one cationic surfactant is present in an amount ranging from 0.1 to 5% by weight relative to the total weight of the composition. 8. The composition of claim 7, wherein the at least one cationic surfactant is present in an amount ranging from 0.2 to 4% by weight relative to the total weight of the composition. 10. The composition of claim 9, wherein in formula (VI), the sum n+m ranges from 50 to 150, n ranges from 49 to 149, and m ranges from 1 to 10. 11. The composition of claim 9, wherein in formula (VIII), R5 is chosen from C1-C18 alkyl radicals and C2-C18 alkenyl radicals. 12. The composition of claim 9, wherein in formula (VIII), R6 is chosen from C1-C18 alkylene radicals. 13. The composition of claim 9, wherein in formula (VIII), r is a mean statistical value ranging from 2 to 8; and s is a mean statistical value ranging from 20 to 50.
in which n is an integer ranging from 1 to 5, and m is an integer ranging from 1 to 5. 15. The composition of claim 9, wherein in formula (IX), R7 is chosen from C1-C18 alkyl radicals, C2-C18 alkenyl radicals, and rings comprising from 5 to 6 carbon atoms. 16. The composition of claim 9, wherein in formula (IX), R6 is chosen from C1-C18 alkylene radicals. 17. The composition of claim 9, wherein in formula (IX), R8, is chosen from C1-C18 alkyl radicals and C2-C18 alkenyl radicals. 18. The composition of claim 9, wherein in formula (IX), r is a mean statistical value ranging from 5 to 100. 19. 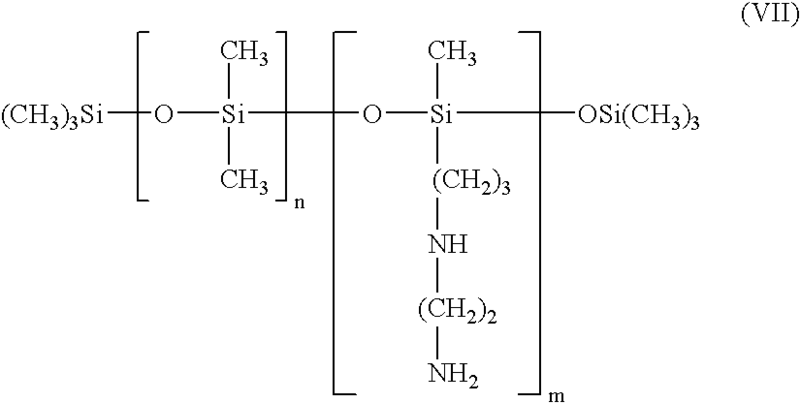 The composition of claim 1, wherein the at least one aminated silicone is chosen from amodimethicones and trimethylsilylamodimethicones, or silicones comprising quaternary ammonium groups. 20. The composition of claim 1, wherein the at least one aminated silicone is present in the composition in amount ranging from 0.01 to 6% by weight relative to the total weight of the composition. 21. The composition of claim 20, wherein the at least one aminated silicone is present in an amount ranging from 0.1 to 3% by weight relative to the total weight of the composition. 22. The composition of claim 21, wherein the at least one aminated silicone is present in an amount ranging from 0.4 to 2% by weight relative to the total weight of the composition. 23. The composition of claim 1, wherein the fatty alcohol is linear or branched and saturated or unsaturated. 24. The composition of claim 23, wherein the at least one fatty alcohol has the structure R—OH, in which R is chosen from saturated or unsaturated, linear or branched radicals comprising from 8 to 40 carbon atoms. 25. The composition of claim 24, wherein R is chosen from saturated or unsaturated, linear or brached radicals comprising from 8 to 30 carbon atoms. 26. The composition of claim 24, wherein the at least one fatty alcohol is chosen from cetyl alcohol, stearyl alcohol, oleyl alcohol, and mixtures thereof. 27. The composition of claim 1, wherein the fatty alcohol is solid or pasty at ambient temperature. 28. The composition of claim 1, wherein the at least one fatty alcohol is present in the composition in an amount ranging from 0.1 to 15% by weight relative to the total weight of the composition. 29. The composition of claim 28, wherein the at least one fatty alcohol is present in an amount ranging from 0.5 to 10% by weight relative to the total weight of the composition. 30. The composition of claim 29, wherein the at least one fatty alcohol is present in an amount ranging from 2 to 8% by weight relative to the total weight of the composition. 31. The composition of claim 1, wherein the at least one diol is chosen from 1,6-hexanediol, dipropylene glycol, and mixtures thereof. 32. The composition of claim 1, wherein the at least one diol is present in the composition in an amount ranging from 0.1 to 10% by weight relative to the total weight of the composition. 33. The composition of claim 32, wherein the at least one diol is present in an amount ranging from 0.25 to 5% by weight relative to the total weight of the composition. 34. The composition of claim 33, wherein the at least one diol is present in an amount ranging from 0.5 to 3% by weight relative to the total weight of the composition. 35. The composition of claim 1, wherein the ratio of the weight concentrations of fatty alcohol/cationic surfactant ranges from 1 to 10. 36. The composition of claim 35, wherein the ratio of the weight concentrations of fatty alcohol/cationic surfactant ranges from 1 to 5. 37. The composition of claim 1, wherein the ratio of the weight concentrations of cationic surfactant/silicone ranges from 0.85 to 10. 38. The composition of claim 37, wherein the ratio of the weight concentrations of cationic surfactant/silicone ranges from 0.85 to 5. 39. The composition of claim 1, wherein the ratio of the weight concentrations of fatty alcohol/silicone ranges from 2 to 5. 40. The composition of claim 1, wherein the cosmetically acceptable medium is chosen from water, cosmetically acceptable solvents, and water-solvent mixtures. 41. The composition of claim 40, wherein the cosmetically acceptable solvent is chosen from ethanol and isopropanol. 42. The composition of claim 1, further comprising at least one additive chosen from fragrances, UV screening agents, nonionic surfactants, anionic surfactants, amphoteric surfactants, and zwitterionic surfactants, preservatives, proteins, vitamins, provitamine, nonionic polymers, anionic polymers, cationic polymers, amphoteric polymers, and zwitterionic polymers, mineral oils, vegetable oils, and synthetic oils, antidandruff agents, agents for combating hair loss, dyes, pigments, reducing agents, non-aminated silicones, vegetable waxes, and ceramides. 44. The method of claim 43, wherein the composition is applied to the hair and/or scalp after shampooing. FI87138B (en) 1992-08-31 The compositions Foer haorkonditionering.